If you find our flower bouquets and baskets beautiful, you will be bowled over by our Outstanding Birthday Flowers. This graceful and artistic arrangement of 50 pink roses basket along with greenery is done by our expert florist and as the name suggests is truly outstanding. 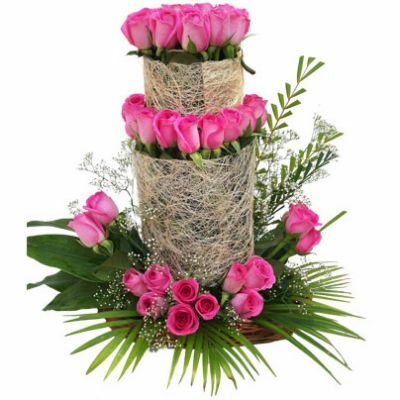 Pink roses symbolize romance so go ahead send roses bouquet online and declare your fondness gracefully. Pink roses are elegant and while a lighter shade of pink indicates appreciation and friendship, a darker shade of pink roses symbolizes gratitude.No matter what emotions you want to portray, send flowers and let our fresh sweet flowers convey your message effectively.